. :: The Perils Of Show Jumping Sport - 22 ::. From Oliva in Spain to Cairo in Egypt; another mad mad week with the WKD Show Jumping Team!!! Well everyone….it's been a while since my last blog - and surprisingly or not - we have managed to clock up a few more countries and a few more air miles since then! We finished up the tour in Vilamoura, Portugal, with a lovely fourth place finish in the four star Grand Prix for Sumas Zorro and the next stop for the Team was to be sunny Spain for the last week of the Oliva Nova Tour on the horses’ way home. As it was the Easter holidays and all our family were staying in Vilamoura with us, it was decided that it would be nice to have a few days of a relaxing break in Vilamoura and have a few days sunning by the pool. I couldn't wait - visions of a lazy Monday leisurely snoozing in the sun filled my dreams on Sunday night. And yup, you guessed it - Monday morning we woke up to black clouds, rain and wind! Sometimes you just have to laugh! But we made the most of it and some very random card games and entertainment ensued - but I must admit I was very happy to be heading to the horses in Spain and to get back to work - I suppose some people aren’t just cut out to relax!! Sam had a super show in Oliva with the 140m class where he really shone. Taking first place the first day with the speedster Limelight de Breve, third place the following day in the medium tour Grand Prix with the big jumping WKD Cairo and second place in Sunday's table C with Limelight again. You can tell how fast he was that even with the last fence down as it was table C with time added instead of faults, he STILL managed second place!! We packed up Monday morning and as we had to try a new horse for Sam in England we went via there back home to Northern Ireland - arriving late Monday night to do a quick repack and laundry stop before heading on Tuesday to our next big adventure: Cairo’s CSI2* on borrowed horses! 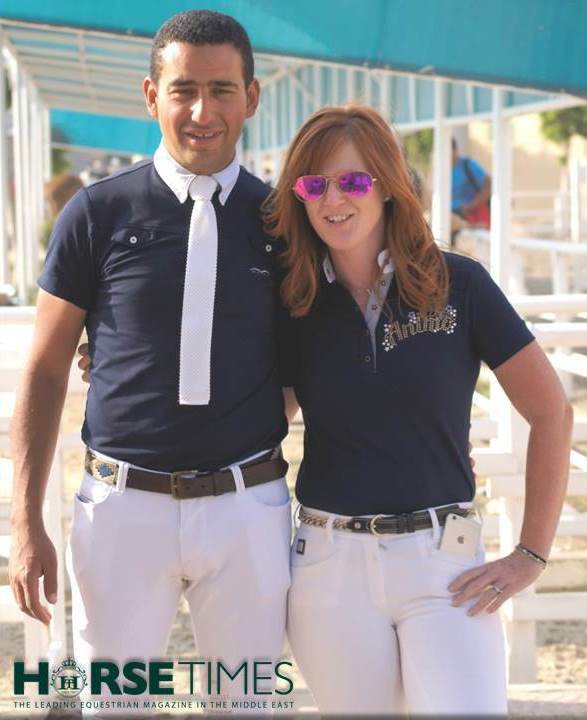 It was a few weeks back we were kindly asked by the Egyptian Equestrian Federation if Sam and I would compete at their international shows - and as it had been a long time since there has been an international two star in Cairo, Sam and I were very keen to oblige. And although we couldn’t do both weeks we had agreed to do the second show at the Cairo Stadium (See photos here >> http://tinyurl.com/l2663go ). It was promising to be a fun weekend as a lot of other riders that we knew from Europe were also coming to compete and for us it was nice to be able to combine work with a holiday - and the chance for Sam to catch up with all his family and friends at home in Cairo. We arrived late Tuesday night, and Wednesday was spent getting to see our mounts for the show and try them out. I was a bit nervous as unlike Sam, who could probably take one of the horses from the tour guides at Giza and make it jump cleanly around a track, I didn’t have the same self-belief or strength and was a bit worried about what I might get! However, thanks to Sam’s good friend Mohamed El Gayar I got the nice mare Menah, who although a little strong in the mouth and bit tricky for me to turn the first day, still went round for a clean jumping score in the two phases of the first class on Thursday. A change of bit on Friday resulted in a tenth placing and another clear and I was very happy overall with the jumping end of the trip! Sam was his usual amazing self and steered his ride from Sherif El Barawy, the lovely mare Marine Z (who Sam had actually started her career as a young horse before he left Egypt), to a second and first place in Thursday and Fridays big tour classes. 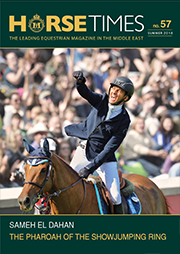 He also returned a sixth place in the medium tour with Leganda and a seventh place in the Grand Prix with the President of the Egyptian Equestrian Federation Hisham Hattab's horse, Butterscotch. It was great to see him doing so well at home and really nice for all his friends and family who all came to support him at the show. But it wouldn't be a trip to Cairo for us if it didn't involve us having to overlap various social functions in order to fit everything in (one previous visit I remember clearly Sam and I having to attend three dinners in one night!). Everyone is so hospitable, and of course there is always so much going on; just trickily for us everything seemed to be on the Friday night! So our itinerary went something like this: Friday we jumped at the show, I left early to get my hair done as our first stop was a wedding that evening. All fine so far...I arrived into the house to be informed we were very late, and I had five minutes to change (at least I had nice hair) oh, and by the way we also had to attend a dinner on a Nile Cruise that night hosted by the show (my wedding outfit might look a tad over the top for this). And oh, also after that we were meeting up with friends at a club across town!!! Yup, could only happen to us!!! My evening consisted of hurtling across Cairo to various venues, whilst trying to change my wardrobe in the back of the car. We managed to fit in all three things - plus I managed to finish the purchase of Sam’s new Grand Prix horse by text - with the seller in Las Vegas watching the World Cup and me in a nightclub in Cairo. Surely an example of taking multi-tasking to a whole new level! It was an amazing few days though; we had a lot of fun and met so many new friends, and caught up with so many old ones. I love this sport and how you get to mix with such different people and see and do so many random things - or maybe that's just us! We are home now in Ireland for a week to prepare for our next adventure, the LGCT in Madrid, Spain, where Sam will compete in the 5* classes with his new horse, Laura Renwick's former ride, the ten year old, Lord Z gelding, Louis d'or Daymon Z, for the first time, alongside our mega mare, Sumas Zorro who will compete in the LGCT Grand Prix, all being well.